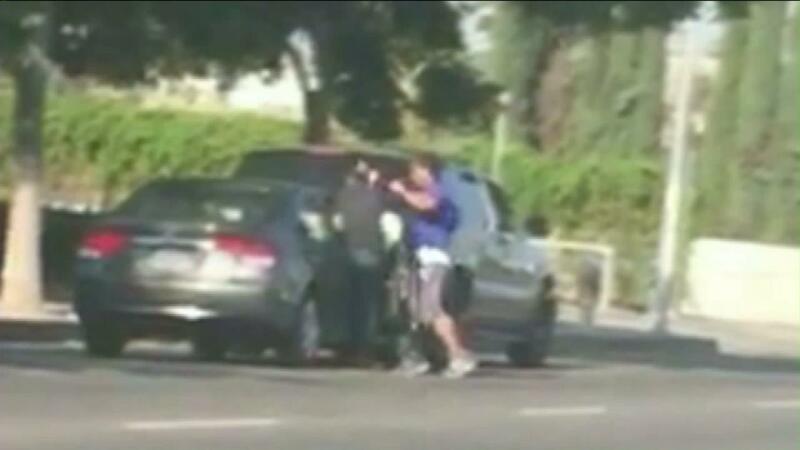 (KTLA) -- A woman captured a road rage incident in Panorama City on her cellphone. The incident occurred about 5:15 p.m. Tuesday near the intersection of Roscoe Boulevard and Noble Avenue, near a junior high school. The woman, who did not want to be identified, said the driver of a Honda honked at a man in an SUV who apparently cut him off. The man in the SUV then slammed on his breaks and the Honda rear-ended him. When both men got out of their vehicles to inspect the damage, the driver of the SUV confronted the other man and repeatedly hit him, the cellphone video shows. When the SUV driver started to walk away, the victim apparently said something to the man, who then returned to the victim and punched him again. The woman said she did not expect that to happen. "Road rage has gotten crazy," she told KTLA. The woman said she alerted authorities of the incident and turned over the video to the Los Angeles Police Department.